Duplex stainless steels (DSSs) are corrosion-resistant alloys extensively used in aggressive environments. Cast DSSs may be selected for pipes, valves and pumps in chemical, petrochemical and nuclear industries. The grade steel ASTM A890 1B is an example of cast DSS with 2.7-3.3%Cu addition. Copper increases the resistance to many types of corrosion, especially in non-oxidizing environments. When the copper content is higher than 2%, the steel can be precipitation-hardened. 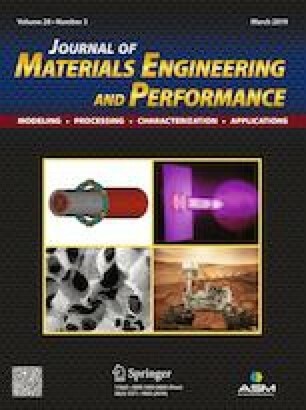 In this work, the precipitation hardening of a DSS ASTM A890 1B steel with 3.0%Cu was studied and modeled for aging temperatures in the 450-600 °C range. Copper precipitates in the ferrite phase, but remains in solid solution in the austenite. The age hardening curves were modeled by ΔH = K(t)n model, where ΔH is the increase in hardness, t is the aging time, and K and n are constants to be determined. The microstructure and substructure were investigated by scanning electron and transmission electron microscopes. Authors are grateful to Brazilian Research Agencies CAPES, CNPq and FAPERJ for financial support.